Grizzled ex-general Kaspar von Velten finds himself unprepared for his duties as the new ambassador to the court of Tsarina. Not ready for the power struggles and politics, Kaspar is soon using his battlefield experience to cajole, influence, and get his way. But when a member of Tsarina’s family is murdered in Kaspar’s homeland, relationships become strained to the point of war. This time let me re-write the product info because I feel the one I copied and pasted from Goodreads hardly does this book justice. So… where to start? Ok, let’s try the beginning. A grizzled ex-general who behaves like a teenager finds himself unprepared for his duties because, as soon as he arrives, he falls in insta-love with a local hussy of noble birth. Insert a major roll-eye. Kaspar, the said general, is the new ambassador to the court of Tsarina but he comes to a foreign country without a cook, servants or money. What’s even worse, he comes without any agenda, hidden or otherwise. By the way the Tsarina, who seems to be a love child of the Snow Queen and Ivan the Terrible, has just one notable trait, her blue hair, and a super-duper sword inherited from an ancestor – not especially impressive. Ok, let me return to the actual plot. Not ready for the power struggles and politics, Kaspar makes one cliche mistake after another. Remind me again, why such a klutz was sent abroad in a capacity of an ambassador? No idea? Oh well… His battlefield experience also seems to be very limited – it should have taught him to travel with a cook and plenty of food supplies for instance. By the way, an ambassador or not, never quarrel with a man you know nothing about as soon as you arrive to your new post. This book disappointed me and I DNFed it with real pleasure after hitting one third of all pages. I hate stupid ambassadors and, generally, stupid characters. 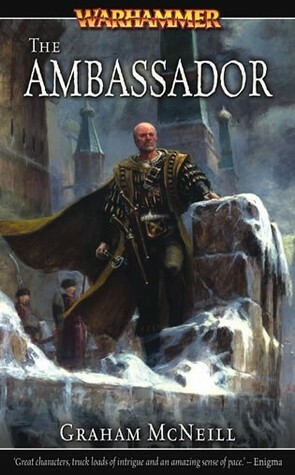 This entry was posted in a total failure, adventure, book review, fantasy, grimdark, rating and tagged a hero too stupid to live, bad fantasy, fantasy russia, graham mcneill, series alert, the ambassador, warhammer. Bookmark the permalink. Why on earth are you reading Warhammer books!